Imagine two days of inspirational workshops, coffee on tap, words of wisdom; and you have the Birchbox x Oliver Bonas event. If you don't happen to know, Birchbox is a monthly beauty subscription service that delivers a collection of gorge beauty products to your door for a monthly fee (think, the beauty version of Netflix. Pretty fab eh?) This month, both brands joined forces to create two gorgeous Birchbox boxes featuring Oliver Bonas' AW17 designs. The playfully patterned boxes were themed around expression and emotion, beautifully designed with the Oliver Bonas company values in mind; Work Hard, Play Hard & Be Kind. To celebrate the collaboration, I made my way to central London to the dreamiest communal workspace the two brands had set up for the occasion. 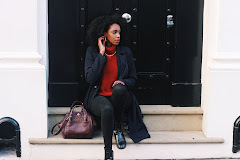 I attended workshops with the likes of Chloe Watts, founder of Chloe Digital, Podcast queen Emma Gannon, and style blogger and confidence coach Freddie Harrel. The topics ranged from practising mindfulness, being your own boss, and how to work with others effectively. Yes, it was brilliant as it sounds! It was one of those moments that left me glowing from the inside out. Why? Not only did I get the opportunity to meet so many talented, friendly, and compassionate women; but it also reminded me how magical life can be when we band together (We are awesome after all). Believe it or not, a challenge is a great thing. It's possible to push yourself in order to reach your full potential - without compromising your wellbeing - to set yourself new goals, and stay back a little later to achieve them. I often like to check in with myself to see if I'm doing my job the best I can. Is there a way I can be more efficient, or save time? Or am I slacking in an area way more than I should be? Either way, it's never too late to pull your socks up and get your work mojo back. After all, what is work without play? For me, downtime almost makes the extra hours I put into work that extra bit sweeter. Now, this doesn't just involve rest, oh no. This involves making time to do fun things you well and truly love. The kind of things that you'll remember many years down the line and laugh about. A couple of years ago my sister introduced me to the wonderful world of escape games. To this day, I've been to far too many of them... and I'm not about to stop just yet! Escape rooms are kind of like the Crystal Maze. You get locked in a room, and you have an hour to crack clues and solve puzzles in order to escape. Yes, it sounds super strange but it's so much fun, and you feel like a total badass if you make it out in time. Whatever that 'thing' is that helps you take life a little less seriously, do more of it! No matter how talented you are, character and kindness will always be key. In a world where we're encouraged to win-at-all-costs, kindness is a quality that can often be overlooked. And yet, it's the quality that will set you apart, help you make deeper connections with others, and open doors. I'm sure you'll agree, there's nothing more attractive than a genuine and friendly soul.